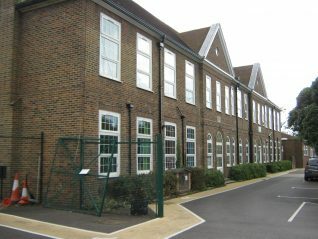 Moulsecoomb primary school was built in 1929 and then extended over the years. 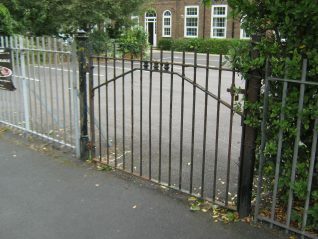 The entrance to the infants was from Hodshrove Lane and the juniors was from Hillside. 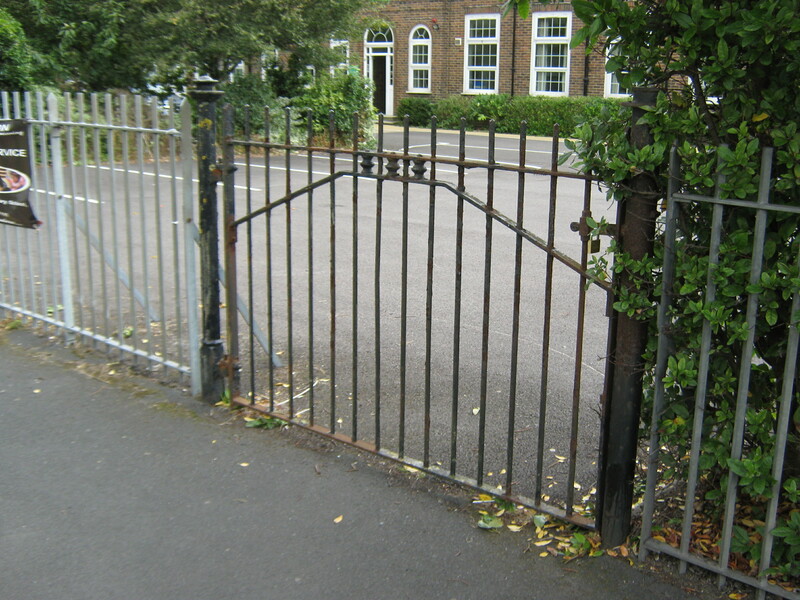 The main building on the Lewes Road came next and was the secondary school for over fifty years before it became part of the primary school. My Mum and Dad both went to the school in the 1940s as they lived on the estate. While I attended a new hall was built which took up half of the girls’ playground. This unfortunately meant that the girls had to go through the boys’ playground every morning, and on snowy days had to run the risk of being pelted with snow. There were additional classes in buildings similar to nissen huts, which were situated behind the school going up towards the primary schools. I went there from 1968-1973 when the Headmaster was Mr Evans, a rather fearsome chap nick-named by the pupils as ‘Streaky’ although we never knew why. The teachers were very strict and the cane and slipper were readily used to instill discipline. Detentions were given out for bad behaviour, lateness and poor work. We mostly did as we were told and if you didn’t then there was hell to pay, even worse was being sent to see Mr Evans. I once wore a slightly off white shirt and my teacher deliberately sent me down to the office with the register, so it would get noticed by Mr Evans. The relevant punishment was to be sent home to change and make up the time after school. 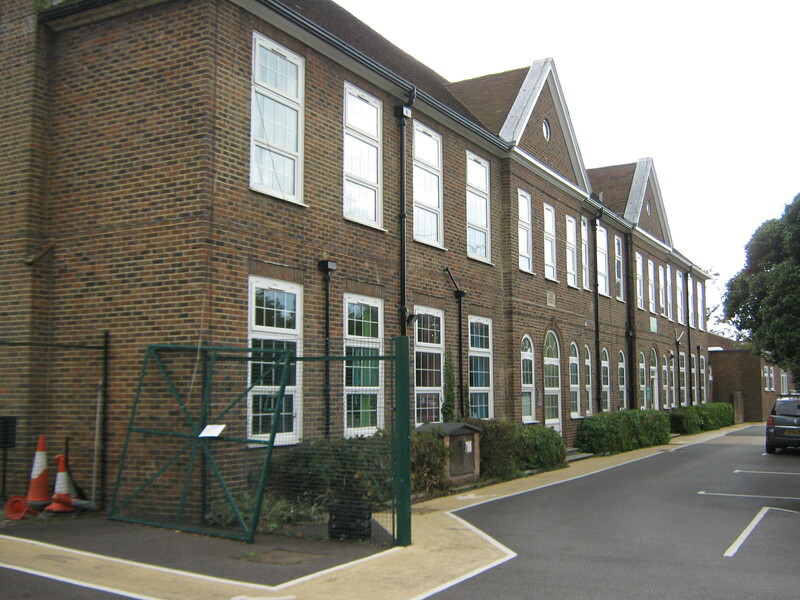 Did you attend Moulsecoomb Secondary School? Share your memories by posting a comment below. We were very lucky to have the wide open spaces around the school for break-time and sports lessons. I loved playing football and we used to play on the field between Moulsecoomb Way and Hodshrove Lane. On a cold day the wind would cut you in half and as the ball was usually of the old style leather with laces you didn’t want to get in the way of it too often. The teachers I can remember were Mr Widdup, Mr Bear, Mr Rex, Mr Drakeford, Mr Nix, Mr Leckie, Mr Catchpole, Mr Gregory, Mr Merritt, Mr Peskett, Mr Hindmarsh, Mr Stockbridge, Mr Homer, Mr Tiller, Mr Welch, Mr Hargreaves, Miss Cowl, Miss Dawson, Mrs Merryfield, Miss Mitchell and Miss Dixon. My Mum was taught cookery by Miss Neat in the 40’s who was still there in the 60’s to teach my sister. I remember my first day at Moulsecoomb seniors in September 1968. My parents had been given a list of all the items I would need which included things like the blazer, tie, PE kit, football boots and gym shoes. It was the first day I had ever worn long trousers as well. It was quite scary because some of the teachers’ reputations had gone before them, especially Mr Evans, Mr Widdup and Mr Rex. Mr Widdup was the PE teacher who made our lives a misery in that first year, luckily I never had Mr Rex as a teacher but I did clash with Mr Evans on a couple of occasions. Added to this was the rivalry of the other pupils who had come from other primary schools in Brighton, some of them were friendly but some of the others wanted to make their mark on us ‘Scoomber’s’ as we were known then. I believe now that it was a good school and I’m glad I went there even though it was tough at times, it gave me a good basic education. I was there the same time as you Paul. I left in 1974, and we were the first year to have to stay on for the 5th year, depending on when your birthday was!…Happy days! Hi Sandra, yes you’re right because I left in 1973 and we were the last year to have the option to leave in the 4th year. I enjoyed the 5th year as the teachers tended to treat you more like equals. I got the ‘O’ level I wanted which was Art with a top grade under Miss Dawson, she was very supportive and there were only two of us in the class for the whole year. I attended this school and loved it. I left in the summer of 1972 at age 14+ and worked at Woolworths on Western Road until I was old enough to join the Navy. I can remember Mr. Homer’s predictions of the yellow peril coming over the hills at Wild Park, Mr. Drakeford and the cane, changing the words to some songs in his class as we sang them made him lose it. I spent hours learning about manners from the Tech Drawing teacher who we would distract with questions about boxing and watch him wander off into the subject. I remember being in the school plays. I remember Mrs. Merryfield – Oh how I loved that woman. I once stopped at her very beautiful house during a cross country run. I think she was my first love as an infatuated young boy. Remember putting iron filings in the furnace in the metalwork shop to make sparks and will never forget the glue pots in woodwork. Mr. Leckie made me love literature and have a tolerance for cricket. We moved from Boston Street, Brighton in the mid 50s to Moulscoomb and went to the Moulscoomb infants/ juniors and seniors from 1956/ 66. l remember all the teachers from the seniors, and it’s true the cane/slipper came out if you as much were to run along the corridor. We had Mr Widdup as class teacher also he took PE which l hated, l left school in 1966 and straight into work and for me l learned more than l did at school but that was my fault. The only thing l enjoyed was the art class, the only thing l was any good at. 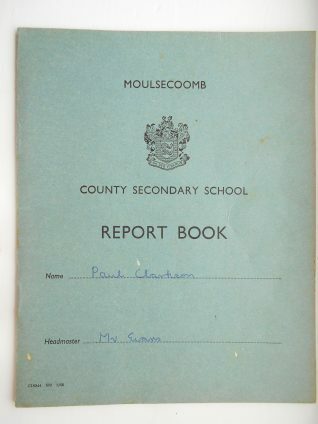 I went to Moulscoomb School in 1972. My teachers were Miss Thompson, Mr Holmer, Miss Cow, Mr Hargraves was my form teacher, Mr Tiller was my art teacher and Mr Bear, Mr Merit and Miss Mitchell. I hated going to school so when I was in the fourth year Mr Homer told me I looked too old to be in school so I used to bunk of with Sue Southern. We would go over to the shop opposite the school, Woolvens, get a quarter of sweets, go back to Sue’s house in Southall Ave, stay there till 3.30 then I’d go home. Bless him I loved that teacher! Mr Catchpole was deputy head, Mr Evans was headteacher, Miss Dixon was cookery teacher and I still see her now up at Asda bless her heart. Don’t see anyone from my class now. I remember Linda Ockenden, Tayna Jackson, Sue Barcock, Lisa and Jackie Gibbs, Amanda Lord, Lorraine Chambers, Beverley Dawson, Kevin Beard, Paul Chippendale, Ian Sinclair, Steve Bean. I wonder where these people are now. I also went to Moulsecoomb School. I took sewing classes at the school and borrowed £25.00 off my dad to buy a sewing machine and paid back out of my paper round money. I then worked in a factory making under wear for M&S. Have my own business now. Thank you Paul for the intriguing article. It brought back vivid memories.I taught English 69-74. Would be privileged if anyone would like contact me. I certainly remember Andrew Deacon and Sandra Harris. Pls use my email….. jon.leckey@gmail.com. To Jon Leckey, first of all many apologies for spelling your name wrong, it was a long time ago. You were my form teacher in 1971-2 when I was in my 4th year. I am very pleased that you have seen my page on this site and I will email you very shortly with some more memories about my days at Moulsecoomb School, after which you may remember me! Hi, I was at this school from 1965 through 1970; I stayed on for the extra year to get my O levels. I remember the school with fondness, I used to do the late book, but never booked anyone more than once or they got detention. I hated assembly and refused to go hence getting the job from Mr Rex. I remember Widdup who regularly left a Dunlop imprint from a trainer he used to whack me with every time I had a shower, don’t think he liked me. Highlight for me was when Johnny Banks called him out on the cricket pitch and they got into a scrap on the grass outside Tillers room out of sight of pupils. Guess who won! Mr Merritt was a great teacher and I had a soft spot for our French teacher Miss Merryfield, bit of a schoolboy crush I think. Mr Hargreaves, boxing mad, and Mr Gregory our woodwork teacher, a great shot with a lump of wood if you misbehaved. And Mr Drakeford RI teacher, I was a regular to his cane, probably because I kept looking after his KitKats for him, couldn’t afford one out of my pocket money. And oh for those broken biscuits we used to buy in the shop opposite the school near Bates Estate. So many memories to share, get in touch if you remember me. I moved down to Brighton from Essex with my Dad in 1966, but didn’t go to school until about 3 weeks before the summer holidays, I must say, I thought my dad had sent me to a school for problem kids at first, as everyone in my class seemed very strange, but after the holidays I did start to make friends like John Alexander, David Prodger, Barry Pledge, to name a few, as I was fairly small for my age, I was bullied along with some of my friends, almost on a daily basis, & it wasn’t until I left school, that I started to stick up for myself. I have met some of the bullies over the years since leaving Moulsecoomb & they all seemed apologetic & lonely, (Karma). I do remember Mr Stockbridge,( what a gentleman) & Mr Widdup ( what an arse), because I had Asthma quite badly, I obviously wasn’t very good at PE & sports, but that didn’t deter him from making my life hell. I do look back on my school days, & unlike a lot of older men who often say ” I would love to be back at school” I have never wished this, I have obviously learned something, but I have learned a hell of a lot more since leaving school. Blimey this brought back loads of memories, I left in 1974. Mrs Merryfield was so lovely, I actually bumped into Mr Homer a few years ago and had a lovely chat with him and he remembered me and my brother (who was always in trouble). Mr Leckey taught me English and it was always the highlight of the day as all the girls adored him. Mr Rex used to terrify me and his wife taught there also and was totally the opposite. I remember learning the violin with Miss Cowell and playing in the orchestra and singing in the choir, I was always put in the front as I was quite short along with good friend Julie Hewett. My other friends were Sandra Harris and Karen Bonwick.